Recently, “The Why Axis” published a post on Raw. They asked us some interesting questions, here we post the complete answers. Q: How did you decide to transition Raw from an internal to a public tool? How did that evolve? As a research lab, we are always committed with exploring the potential of data visualization. In order to obtain reproducible visualizations and facilitate our design process, we have developed numerous scripts in the last years. As one-shot scripts, conceived and optimized for very specific tasks and contexts, it is usually very difficult to share and reuse them, often for us too. As deeply involved in educational activities, both at the Politecnico di Milano and in other universities and institutions, we have seen how very time consuming the visualization process can be for students, forcing them to concentrate their efforts to the development stage instead of exploring and experimenting with the data and new ways of visualizing them. For these reasons, we tried to capitalize our efforts, making scripts and tools more reusable. Raw is the result of this process. It is open-source because we hope to involve the data visualization community in collaborating and implementing the best visualization techniques available. Q: How did it fit into your workflow at DensityDesign? Q: How did you decide which layouts to include in the first release? Were there any reasons you avoided simpler layouts to start? Many of the layouts come from works we have done in the last years (e.g. “Design Research Map”, “Link#10: Decode or die”, or the works we did for “La Lettura – Corriere della Sera”). These layouts allow us to perform a series of visual analysis that are not possible with other techniques already available in softwares such as Microsoft Excel or Adobe Illustrator. Some others (e.g. dendrograms or sunbursts) come directly from d3.js (or its community) and we decided to include them as well, also to test how difficult it could be to add new layouts in Raw. 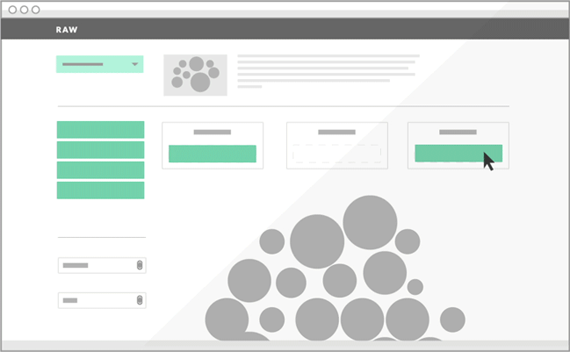 We avoided “simple layouts” like bar charts or pie charts just because there are plenty of tools that allow you to create them in simple and effective ways. Q: What are the plans for the future of RAW? How can the larger data visualization community be a part of these plans? As for the near future, we are currently working on a major redesign of Raw’s architecture, in order to provide APIs to easily create and customize visual layouts and data models. At the same time, we are consolidating the documentation, allowing other developers to understand and improve the code. Our hope is to create a community around the tool, in order to gather new ideas and discuss uses (and misuses) of visual layouts. Moreover, we would like to add new layouts (you can find more information about this here: https://github.com/densitydesign/raw/wiki/Layouts) and understand if and how we can extend the tool to create visualizations based on more than one dataset, such as graphs or geographical data visualization. Our long-term goal is to understand how building a sustainable research model around Raw. As we stated, Raw was born as an internal response to our needs and we had no idea about the kind of reactions this tool would generate. So far, reactions have been extremely positive and we would like to spend more time and resources on this project. However, being a self funded research project and knowing the amount of efforts needed by this kind of tools, we are aware that the main issue will be to provide a continuous maintenance and support. We are still in the process of understanding and evaluating the possible solutions and thus suggestions and/or collaborations are very welcome!